with appropriate amendments and extensions. Please note that familiar names are used rather than given names, where appropriate. Minors are not identified. 1: In the London Gazette of 7 Feb 1922, Henry Kaulbach, as he then was, officially changed the family name to Kaulback, as it remains to this day. Perhaps the family had already anglicised the pronunciation and he was now simply harmonising the spelling. It might all now look a bit late in the day anyway, and would have seemed more of a priority back in the dark days of the Great War when public Germanophobia was at its height, but it will have to remain a minor mystery! Obviously there is a limit to how far backwards or sideways one can extend a family tree, and the zone of our personal interest is anyway probably demarcated by great grandparents and second cousins – sometimes rather less! Nothing is known of the von Kaulbachs of München [between 1730 and the 1800's] until Wilhelm von Kaulbach (15 Oct 1805 – 7 Apr 1874) became the protégé and court painter of Ludwig I of Bavaria, one of the "Mad Ludwigs" who were such colourful figures of that period. That the family must have passed through hard times following the wars of the 17th century can be deduced from the fact that Wilhelm's father Philipp Karl Friedrich von Kaulbach (1775-1846) was having to earn his living as a goldsmith, a near social impossibility for a titled family in the Germany of those days. 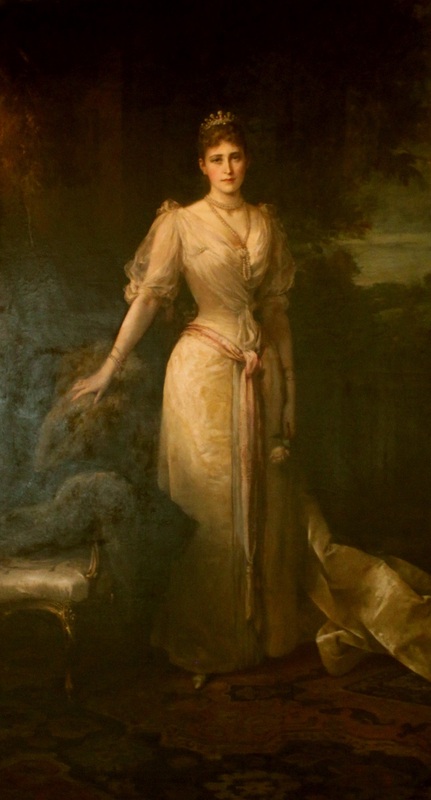 But however that may be, from the time of Wilhelm's recognition as a painter of great merit by the Bavarian Royal House, their fortunes changed, prosperity returned and at least four members of the family became internationally known. Wilhelm received many honours and distinctions during his life apart from those conferred on him by his patron the King of Bavaria. He was granted the Legion d'Honneur by the French and created a Grand Commander of the Order of Franz Joseph by the Austrian Emperor. 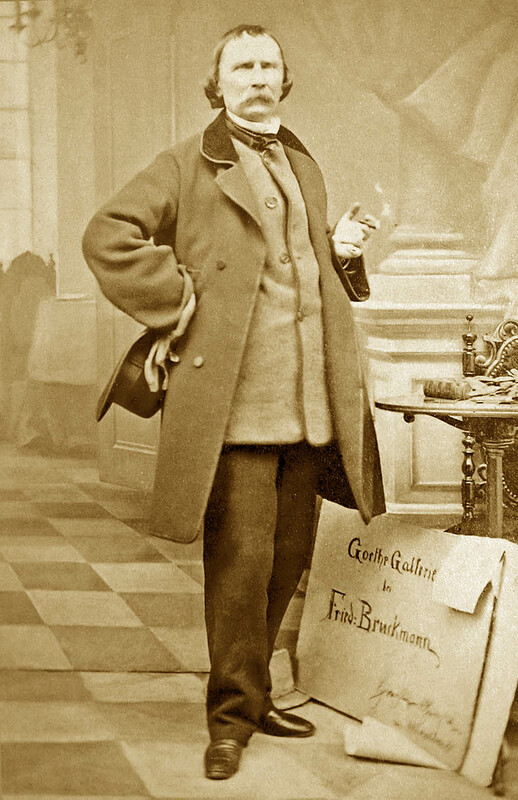 Finally, after his death, the street in München on which the von Kaulbach [mansion] stood was named von Kaulbach Strasse, a name which it still bears. 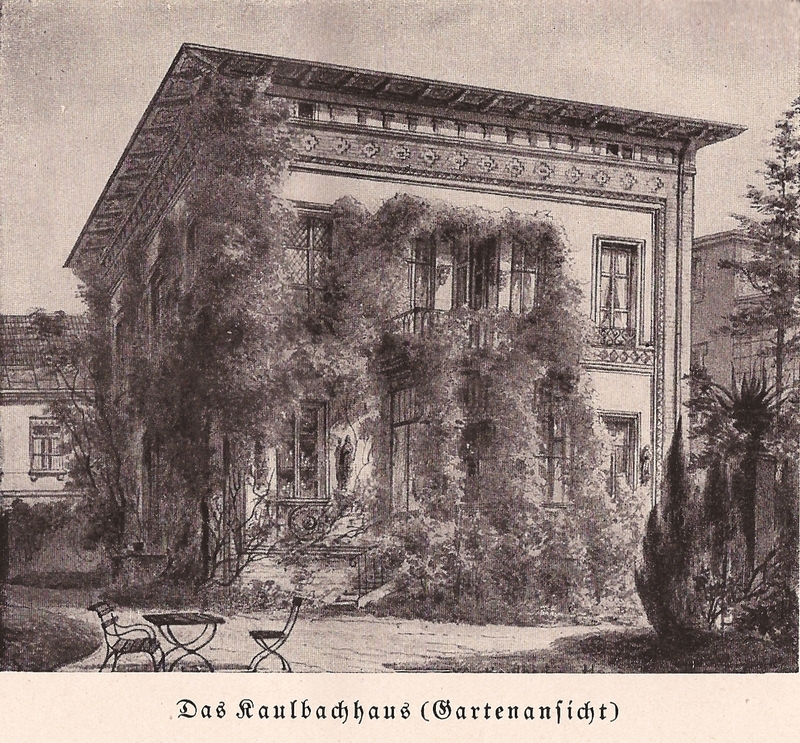 The following images are reproduced from Erinnerungen an Wilhelm von Kaulbach und sein Haus, mit Briefen und hundertsechzig Abbildungen gesammelt von Josefa Durck-Kaulbach, Delphin Verlag München, 1921. All this sounds very meritorious, but barely scratches the surface of the artist himself. To get his true measure we must turn first to Wikipedia and then to some representative examples culled from the internet. All right, he wasn't an A star, but was certainly a highly accomplished B plus for his huge allegorical canvases. And the photographic portraits clearly reveal his very idiosyncratic taste in body-warmers. 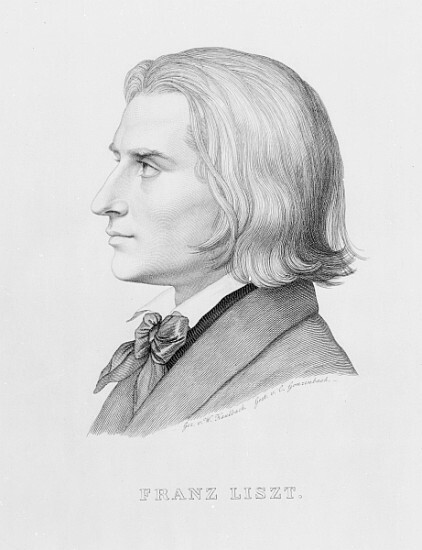 Despite his fervent Protestantism, he seems to have been on friendly terms with Liszt, as witness the rather idealised engraving and soulful portrait we saw in the previous link. 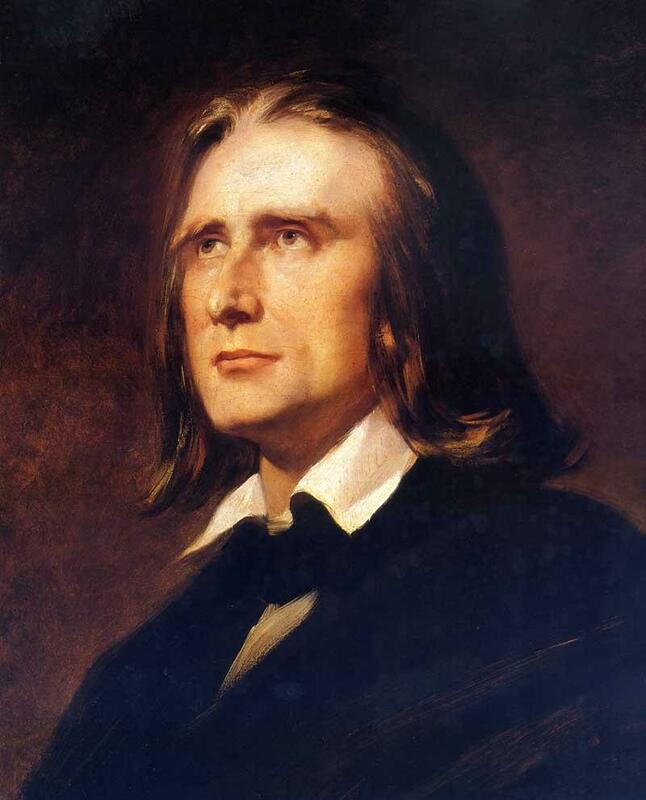 Liszt returned these favours by composing a stirring symphonic poem Die Hunnenschlact (Battle of The Huns) inspired by von Kaulbach's epic picture of that name (and which I found unexpectedly enjoyable when broadcast on Classic FM in early 2012). Rather apposite to our own era, which likewise finds our Western civilisation under assault. 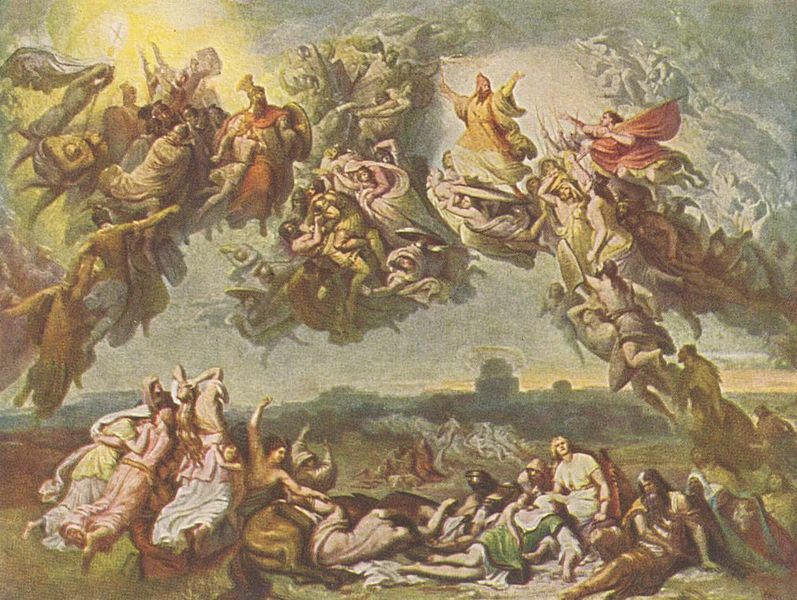 As implied by the extract above from The Kaulbacks, Wilhelm von Kaulbach was by no means the only artistic member of the family. His son Hermann von Kaulbach (26 Jul 1846 – 9 Dec 1909) studied medicine to start with, but switched to painting, initially of historical themes, though was ultimately best known for his portraits of children. 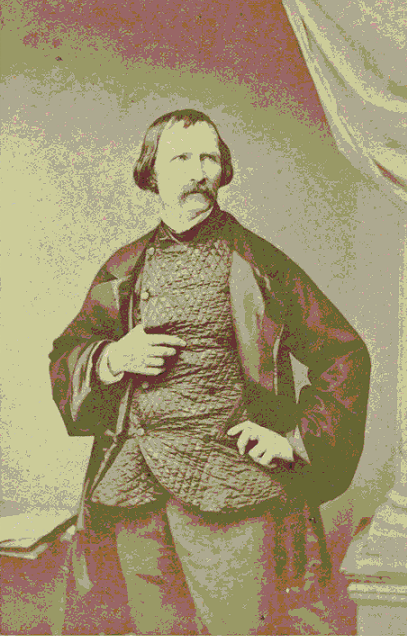 Wilhelm's cousin (though Wikipedia is rather wobbly on the exact degree of cousinhood) Theodor Friedrich Wilhelm Christian Kaulbach (8 Jul 1822 – 17 Sep 1903), known as Friedrich, was a highly successful court painter to King George V of Hanover. He also painted the portrait of Wilhelm shown above. 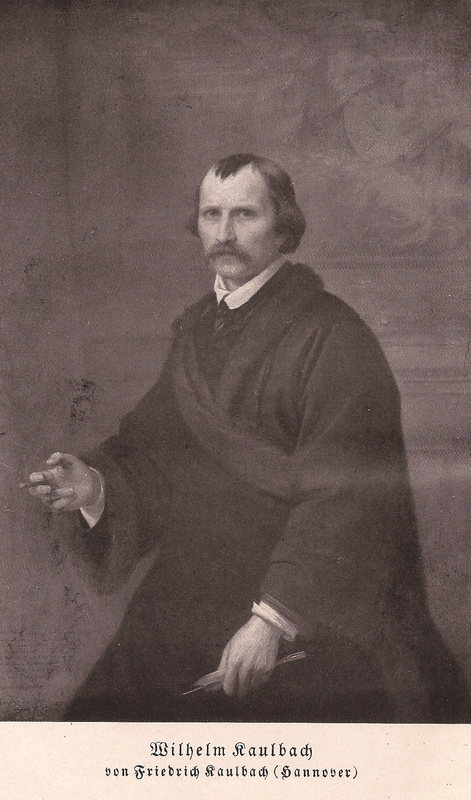 Friedrich's son Friedrich August von Kaulbach (2 Jun 1850 – 26 Jul 1920) was a portraitist1, 2 and historical painter, and is described by Wikipedia as the great-nephew of Wilhelm. 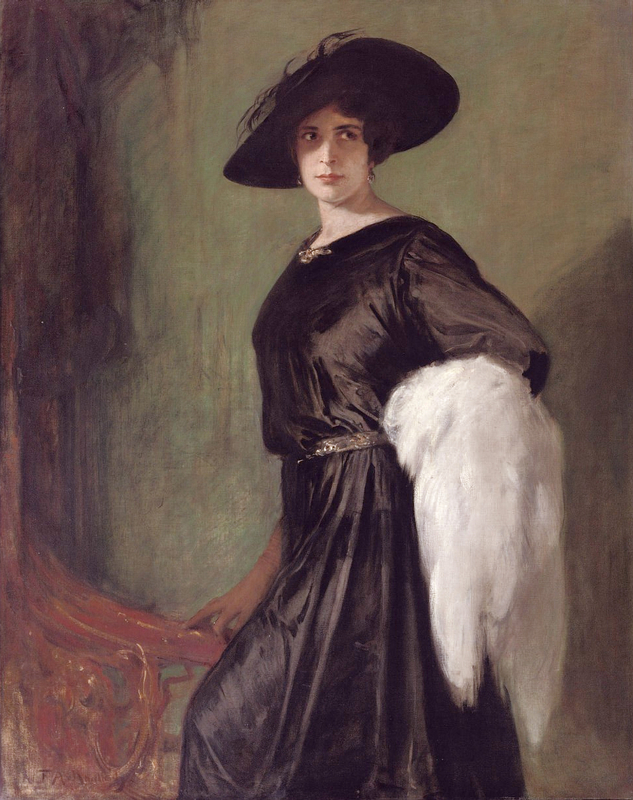 He painted, for example, the rather sumptuous portrait of Hanna Ralph, shown below purely on the basis of its artistic merit, and the tragic figure of the last Tsarina of Russia (although some claim this was actually her elder sister Elisabeth – indeed, they were both brutally murdered by the Bolsheviks after the revolution). 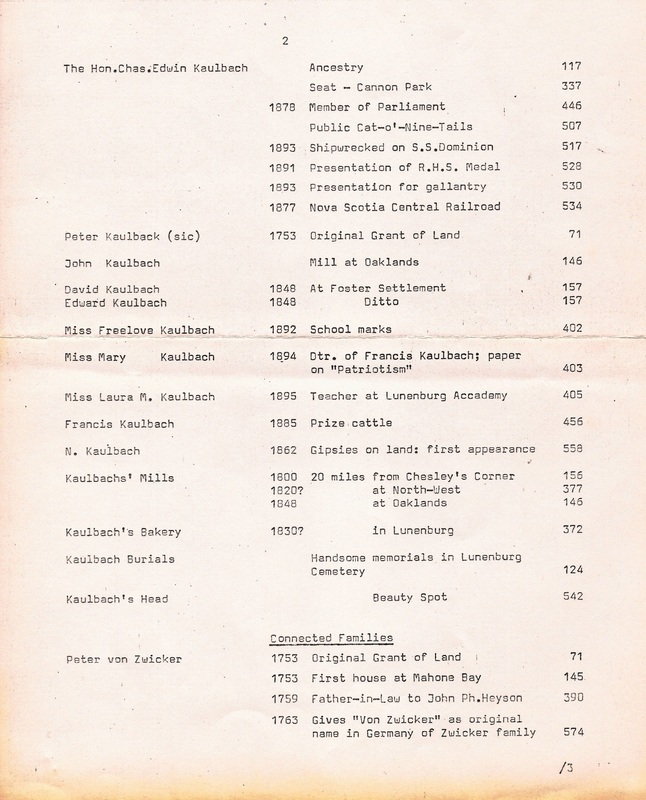 The hyperlinked profiles in the Generation Table are of course taken from Bill Kaulback's admirable The Kaulbacks (1979). In the very first of these, for John Martin von Kaulbach, he discusses the motivations and experiences of those trail-blazing German pioneers in the mid-eighteenth century, though I can't quite reconcile the dates he gives for the voyage of the good ship Ann with those tabulated in the Wikipedia article – perhaps the sturdy Ann made more than one such voyage. and there's also a frequently-referenced academic treatise that I've made absolutely no attempt to track down, life's just too short. 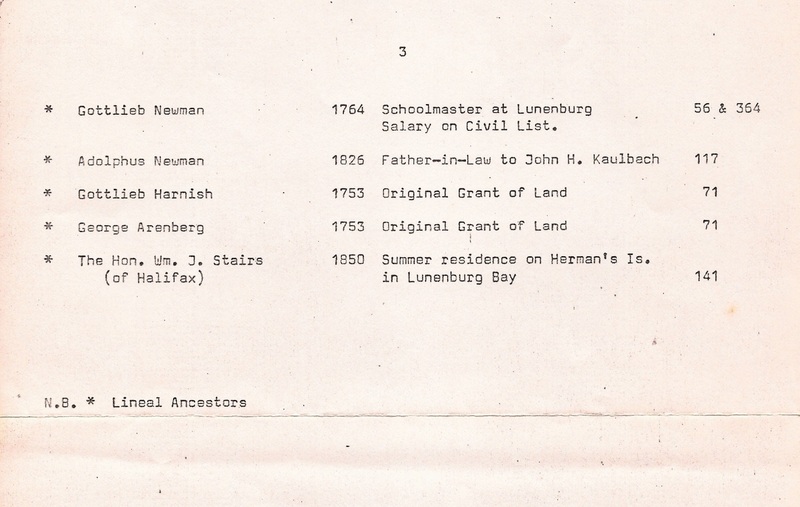 The rapid and successful progress of the Kaulbach family mirrored that of the Lunenberg settlement itself. Indeed, as we have seen from their profile links above, they played a full and active part in the local community, and were in the forefront of public life in the whole of Nova Scotia, as instanced by their unbroken tenure as Lunenberg County Sheriffs for over eighty years, their prominence in the Nova Scotia Militia, and their public offices in the Nova Scotia Assembly. 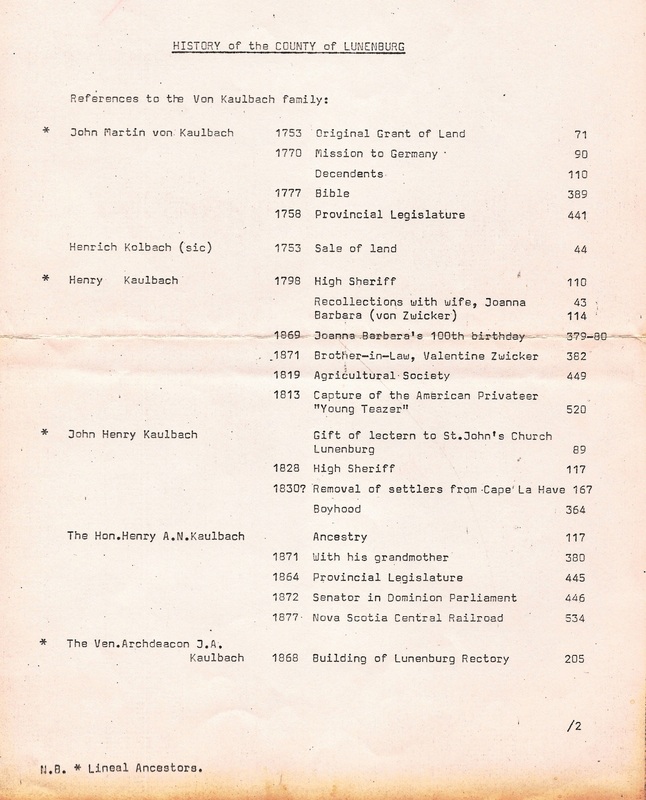 Bill Kaulback compiled this list quite possibly for his own reference when writing The Kaulbacks, but it might also be helpful for a wider audience. 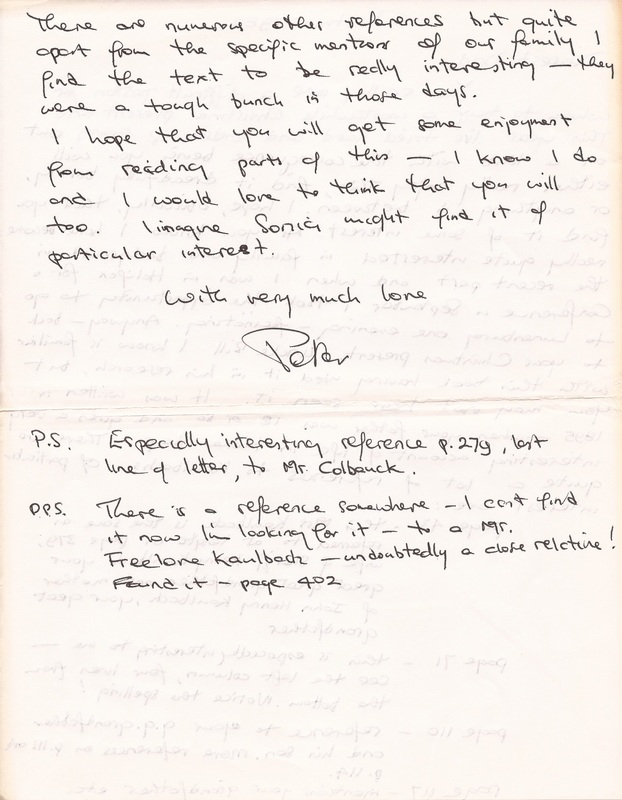 This is of course a personal letter that (most fortunately) has survived. It accompanied a copy of the Mika edition that Peter sent his father for Christmas in 1982. 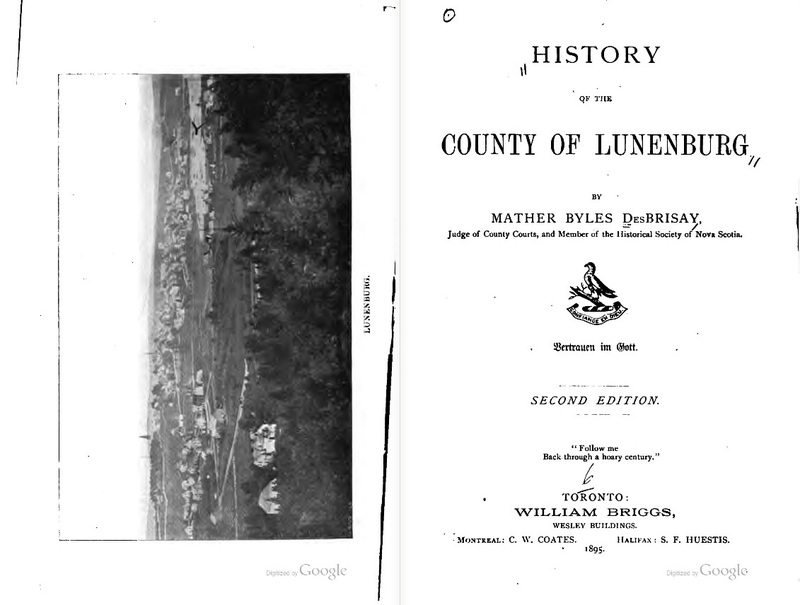 Nothing in it is confidential – indeed it's all about the family involvement in Lunenburg. 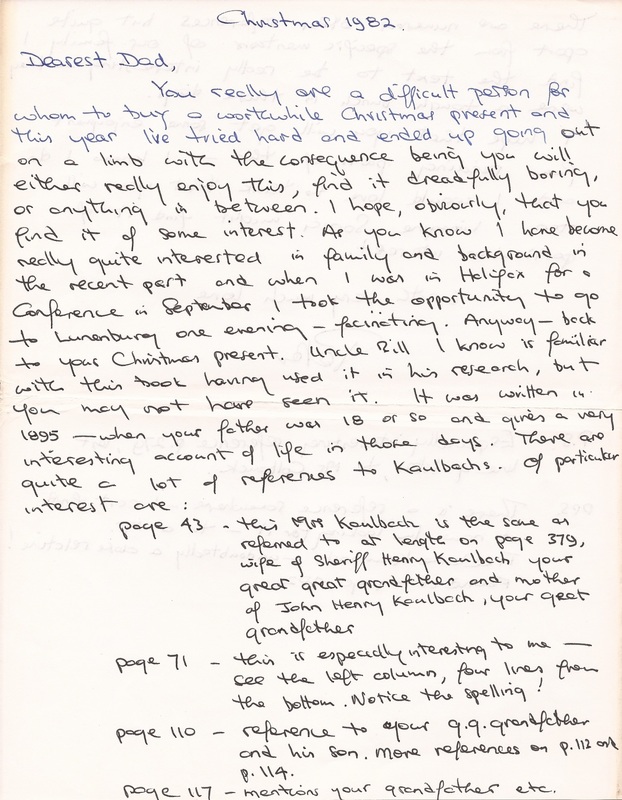 So I have no hesitation in reproducing it here, and it is a happy reminder of Peter's characteristic enthusiasm, generosity and devotion to family. 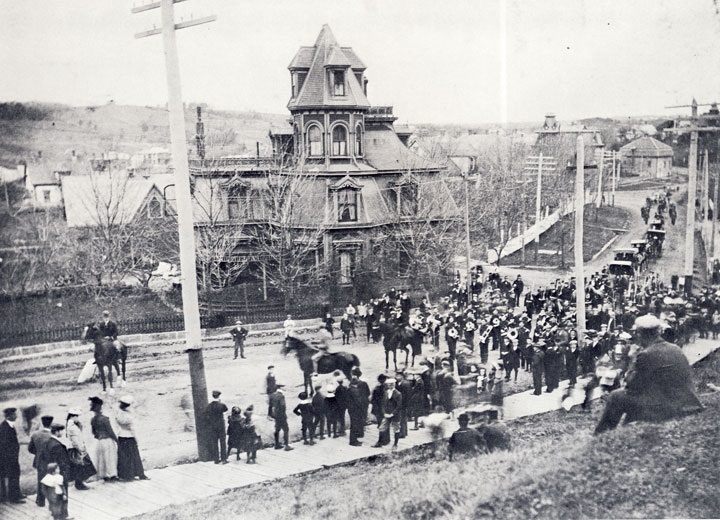 Lunenburg Academy, 97 Kaulbach Street, where John Henry Kaulbach's three sons (Henry Adolphus, Charles Edwin and James Albert) were educated (though it must be admitted that perhaps it was rebuilt back in the 1890's). 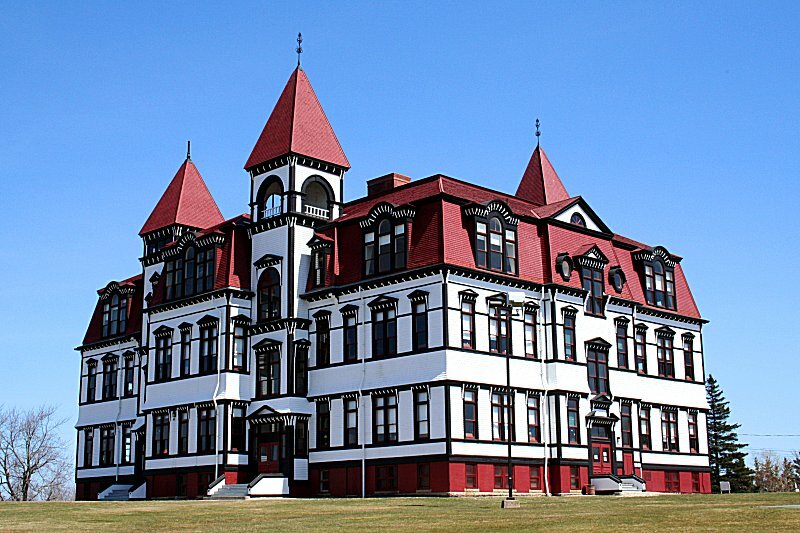 Sadly, I can't find any validated image of Medway Hall, the ancestral home of the Lunenburg Kaulbachs, on the internet – though I did just miss an eBay opportunity earlier this year when an elderly photograph of it went for a measly $20 before I'd noticed. But as consolation prize, here is the handsome façade of Kaulbach House at 75 Pelham Street, Old Town, Lunenburg. In horse-breeding jargon, this is out of Mad King Ludwig II by Walt Disney. DG. I don't know whether Kaulbach Island ever belonged to the Lunenburg Kaulbach family, and strongly suspect that they played no part in building the house (they would have added extra turrets, gables and crenellations) – but I just love the combination of the name, the location, and the quietly understated millionnaire's mansion. CAD $9,500,000 (including all window coverings, furnishings, appliances, equipment, motorboat and sailing boat). 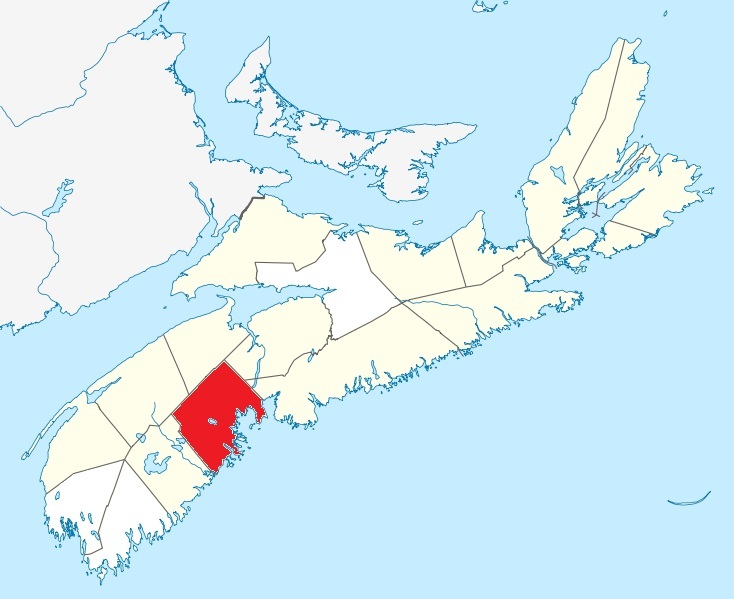 A picturesque private island located close to Chester, Nova Scotia's famous seaside town. Kaulbach Island lies perfectly positioned in the heart of Mahone Bay, protected from the elements by an array of tiny islets, surrounded by crystal clear water and close by to both a sailing club and a golf range. Kaulbach Island is just a short boat ride from the mainland, on Nova Scotia's Bluenose Coast. 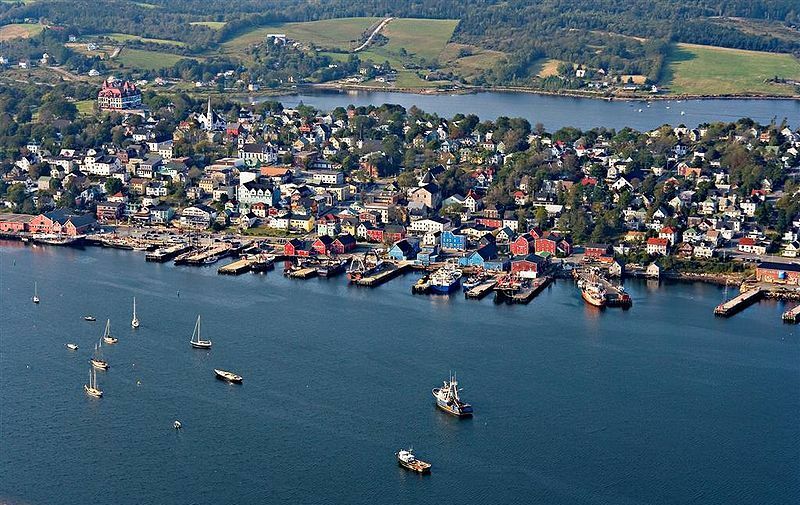 Home to world-class sailing conditions, and close to a hub of activity, within a matter of minutes, you could enjoy the scenic seascapes of Chester or the quaint atmosphere of Mahone Bay, taking in creative festivals, artisans and boutiques along the way. 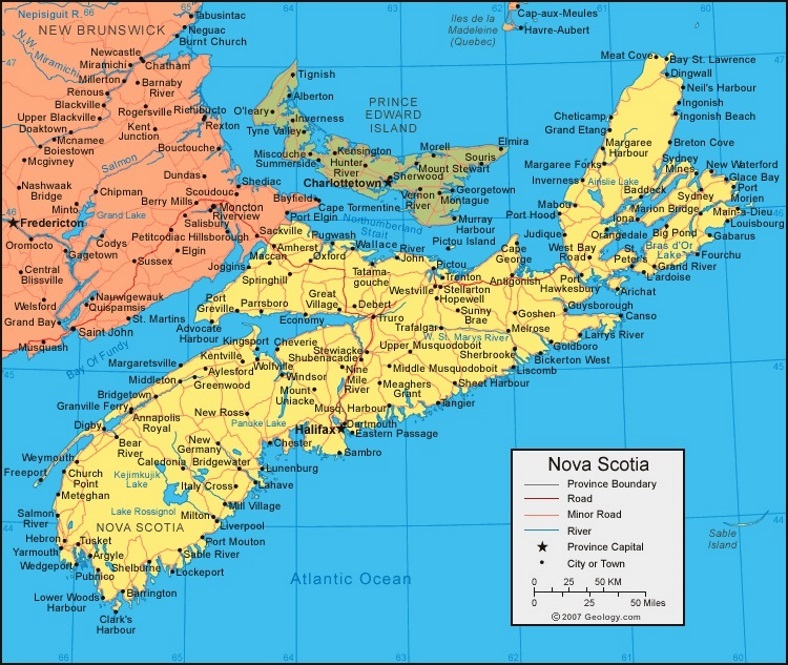 Furthermore, the island is only 90 minutes away from Halifax International Airport, allowing for easy access. The island is more than just a great location however. Osprey Nest, the exceptionally developed 11,040 sq. ft. main house, has a commanding presence overlooking the ocean and the groomed lawns. Framed by colourful gardens and stonewalls, this wonderful home (11 bedrooms, 7 full, 2 half baths) has been thoughtfully designed for gracious family living. Meticulously constructed and maintained, the home warmly welcomes guests for entertaining. Modern and environmentally-friendly, the technology in place at this imposing villa includes effluent disposal and aqua-thermal heat production. With 57 acres of woods, meadows, an 11,040 sq. ft. home, double garage with guest quarters, beach cottage, farmhouse, a few outbuildings and a wharf with deep anchorage, Kaulbach Island is home to everything you could possibly need, including a motorboat and a sailboat. Approx 50% of the area of the island has been newly planted with deciduous trees, a small sandy beach can be found on the south side and spectacular views of the maritime environment can be enjoyed from the island's approx. 35 metre high elevation – there aren't many views that can rival this!